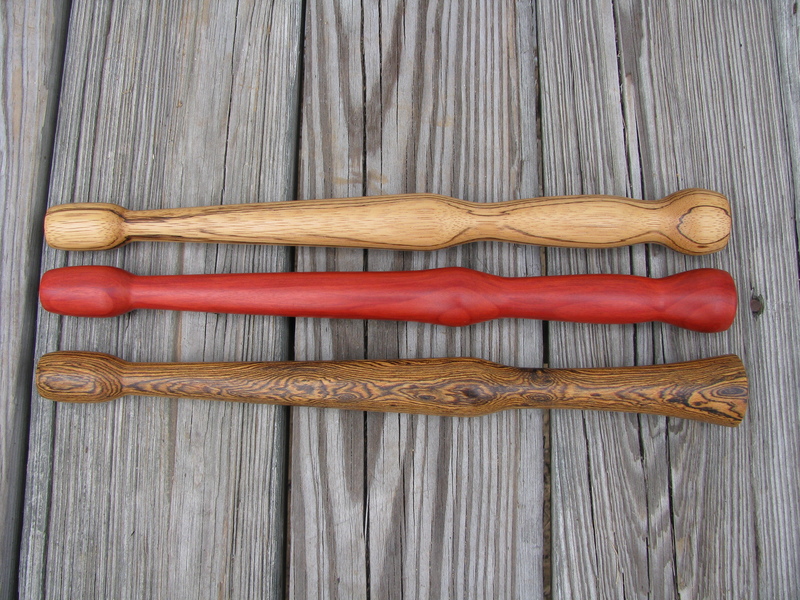 For a while now on my main website, I have not advertised that I sell custom cow whip handles. Though I do make custom handles on request, I don’t really want to get bogged down with orders for them. Cow whip handles are one of the least profitable items I sell given the time they take me to make them. Yet, I was recently told by someone that my handles are “high priced”. Steven Huntress recently posted a great article on his blog addressing the erroneous idea that the value of a product should be based solely upon the cost of the materials used to make it. I commend it to you as I share his point of view on the subject. In my article, I just want to touch on how my handle prices are figured and the rationale behind it. My wife would probably tell you I’m the King of Wasting Time, but I do value my time and I like to spend my productive hours in a profitable way. In general, making whips is probably the best paying job I’ve ever had on an hour per hour basis. However, that doesn’t mean that every facet of whip making is profitable alone. That’s sort of the situation with making cow whip handles. I normally charge a base price of $25.00 to make a standard ash cow whip handle. On exotic wood handles, I charge roughly what it costs me to get the handle blank being used, plus $25.00 per handle for turning and finishing it on the lathe. In the photo, you’re looking at roughly $140.00 worth of handles. That may sound like lots of money, but when I deduct the expense for materials and figure in my time, I could’ve made much better money working on a 12 or 16 plait bullwhip instead. The price I charge for making a custom handle is really the minimum amount I will accept for the time it takes me to do it. I would ask for more, but I’m making a conscious effort to keep the price low. Unlike many markets today, the “whip market” is free and unregulated. Buyers are free to buy, or not to buy a product, and there is a growing number of sellers from which to choose. Are there other, less expensive options out there? Sure. There’s Eli’s in Florida that sells handles cheap. I suspect these are mass produced because all the ones I’ve seen are all clones. What you see is what you get. It’s not a bad handle, but when I sold them as part of my whipmaking kits last year, people didn’t really like them as much as my standard handles. After you figure in UPS shipping rates, the cost of a plain Eli’s handle isn’t much less than one of mine. Don’t get me wrong, I don’t mind making handles. If you want one, please get in touch with me and I’ll be happy to take care of you. Just know that even though the price may sound a little steep from your view, from my view, I’m offering a real bargain. A few weeks ago I was working on my truck. I picked up a Craftsman screwdriver and got to looking at it’s classic, almost iconic grip. All of a sudden the idea hit me: This would be an interesting grip for a bullwhip. That is, in a “novelty” sort of way. I had never seen anything like it before. 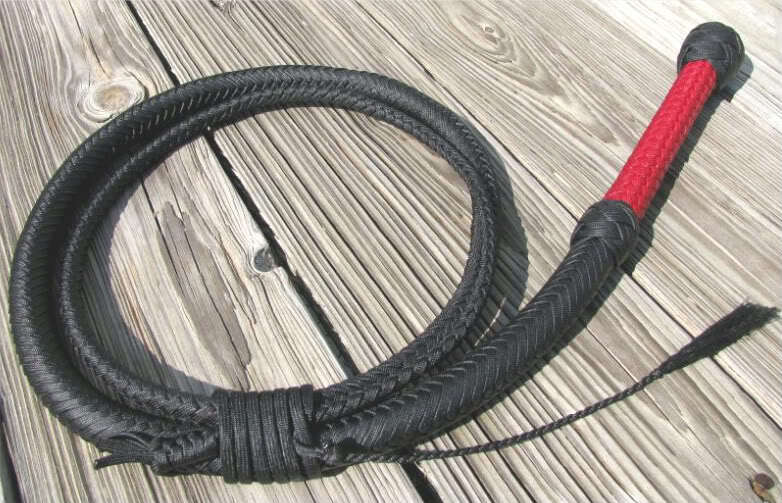 This prototype is built to the same standard as all of my 16 plait woody bullwhips, but with a Craftsman handle. It is now for sale on eBay.